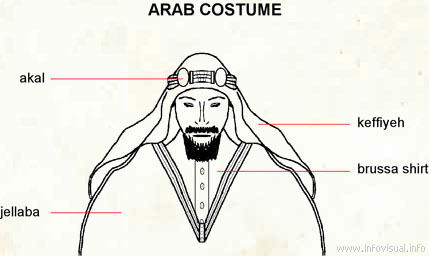 Arab costume - Visual Dictionary - Copyright © 2005-2016 - All rights reserved. [img]https://infovisual.info//storage/app/media/06/img_en/073 arab.jpg[/img] [url=https://infovisual.info/en][/url] - [url=http://www.infovisual.info/]Visual Dictionary[/url] - Copyright © 2005-2016 - All rights reserved. Arab costume: clothing originating in Arabia. Keffiyeh: piece of fabric retained by a band and worn on the head. Jellaba: long dress provided with long sleeves. Akal: band being used to maintain the keffieh in place.